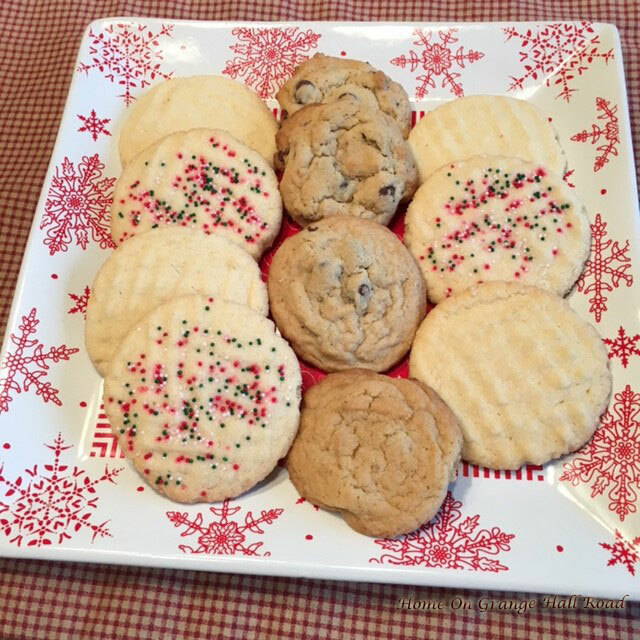 Today I am sharing my two favorite cookies recipes – chocolate chip and sugar cookies. You just can’t go wrong with these amazing cookies and they make wonderful, tasty gifts for friends and family. These adorable containers are perfect for cookie gift-giving. My granddaughter Lainey has had great success with this chocolate chip recipe. She has won first place in the local Heart of Illinois Fair and this past August first place in the Illinois State Fair. Combine butter, sugar, brown sugar, eggs (one at a time) and vanilla in bowl. Beat at medium speed until creamy. Add flour, baking powder, baking soda and salt; beat at low speed until well mixed. Stir in chocolate chips. Drop dough by rounded tablespoonfuls, 2 inches apart, onto parchment lined cookie sheets. Bake 10-12 minutes or until light golden brown. Cool 2 minutes on cookie sheet; remove to cooling rack. My all-time favorite is Old Fashioned Sugar Cookies. This is a recipe that my dear mother-in-law Vera shared with me. I have tweaked it a bit to make it even better. Whisk together flour, cream of tartar, baking soda, and salt and set aside. Cream together thoroughly butter, oil, powdered sugar and granulated sugar. Add eggs (one at a time) and vanilla and beat until smooth. Stir in flour mixture. Blend well. Roll teaspoons of dough into balls then roll in granulated sugar. Place on parchment lined cookie sheet. Flatten in crisscross pattern with fork dipped into sugar. Bake for 10 – 12 minutes. Leave on cookie sheets for 2 minutes, then remove to wire racks to cool. 2. I always bake cookies on parchment paper. 3. I always keep an oven thermometer in my oven to make sure the temperature is correct. 4. I always write down any changes or adjustments that I make so that I can remember what works best!!!! The Old Fashioned Sugar Cookie recipe has been posted on one of my favorite blogs, Keeping It Cozy. And two years ago these cookies placed in the Gold Medal Flour Best Cookie Contest at the Illinois State Fair!! I hope you are enjoying this holiday season. I am looking forward to a nice break from work and spending time at home with my family. Happy baking and hoping you had a very Merry Christmas!